Hm, Santa does look somewhat agitated. Maybe he's a little lonely? So wear one around your neck and feel the love. Makes for a pretty neat Xmas tree decoration as well. 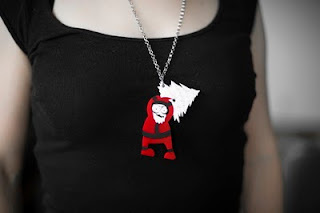 Psychotic Santa pendants are available in various combinations of red, white, black and matt black. Of course, they will be amongst all the other Grimlies at Craft2.0.